The Art at the Park series resumes at Holly Kai Park on Saturday, September 24th, with a new exhibition by four top artists and photographers … and me. Wildstar Beaumont – popular and well-regarded Second Life photographer. I’ll be bringing-up the rear to make up the numbers 🙂 . You can find out more about the artists on the Holly Kai blog. 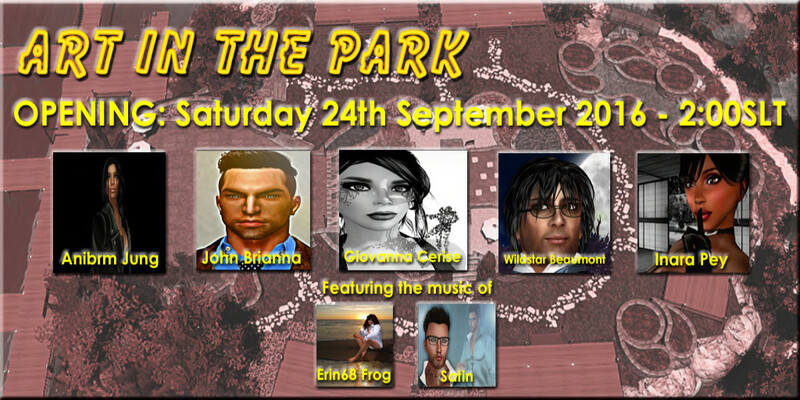 To mark the new exhibition, we’re having a formal opening at 2:00pm SLT, featuring the music of our good friends and supporters of the Park, Erin68 Frog and Satin. They’ll be performing for our dancing pleasure at the new art events area, which is also located on the top of the art hill. As is usual for our openings, we as that guests are formally dressed. Also, in keeping with our policy, the venue won’t be taking tips – but we hope that if you do come along – and we home you will – that you’ll consider donating to our adopted charity Stand Up To Cancer, which, this month is the focus of SL Concerts to Benefit Stand Up to Cancer. Coinciding with the exhibition, we will once again be hosting Stories at the Park in association with Seanchai Library. Each month, story writers and poets from Seanchai Library and beyond are invited to visit Holly Kai Park and view the 2D and 3D art on display, and then to write a 100 word story (a “drabble”) on the art piece or pieces that inspires them – or, if they prefer, to write a poem of up to 100 words. At Stories at the Park, the submitted stories and poems are read in a live voice session in the Storyteller’s Garden. Authors can either read their own works, or if they prefer, have one of the Seanchai Library staff read them. Submitted stories are also published on the Holly Kai Park blog. If you would like to submit pieces for Stories at the Park, and either read them yourself, or have them read on your behalf, then visit the Art at the Park exhibition at Holly Kai Park, and write about the picture(s) or 3D art which inspire you. Stories must be exactly 100 words long, and poems, in any form – blank verse, iambic pentameter, haiku, sonnet, etc. ), can be up to 100 words in length. Finished works should be submitted via note card to either Caledonia Skytower or myself no later than Wednesday, October 12th, 2016. So – welcome to a new season at Holly Kai Park, and we look forward to you visiting! The following notes and audio were taken from the weekly Bento User Group meeting, held on Thursday, September 22nd at 13:00 SLT at the the Hippotropolis Campfire Circle. and chaired by Vir Linden. For details on the meeting agenda, please refer to the Bento User Group wiki page. The Project Bento RC viewer updated to version 5.0.0.319893 on Thursday, September 22nd, 2016. This update contained no functional changes to Bento, but merged it with the current release viewer code (e.g. the addition of the visual Outfit Browser code). The Lab’s focus on the viewer at the moment is seeing how more widespread testing goes (in general use terms, rather than Bento-specific, although this is still of interest), whether issues or regressions arise in the viewer as a whole and watching the crash rate. The latter has been high, but it is hoped the merge with the current release viewer will reduce these. If not, it may be that there are some Bento-specific issues still requiring deeper investigation. Matrice Laville has put together documentation on which bones in the avatar skeleton are affected by the various appearance sliders when editing your shape. This can be found on the Avatar Sliders wiki page. The tables list the affected bones per slider, and how they are affected (translate / scale / both). The eyebrow slider is also included, although this is actually a part of the hair wearable. The was a general discussion on sliders and joint positions, which I’ve attempted to break down by topic point for ease of reference. At the start of September, Vir produced a proof of concept viewer adding the ability to override the scale as well as position for joints in uploaded mesh models. A joint with both position and scale overrides would be effectively “slider-proof” – no sliders that affect the joint would have any effect on the model. This might be useful for those wishing to produce (non-human?) avatars where it might be preferable to have certain parts of the body locked from slider-driven changes to prevent distortions / conflicts arising, without necessarily locking in the entire mesh against slider changes (e.g. the face could be “frozen” to prevent distortion, but body height or tail length, etc). There’s been little feedback on the option to date,so anyone who is interested in the option or has views on how it works / should work, to try this version of the viewer and provide their feedback through the forum ASAP, otherwise the option won’t be included in the Bento RC. At one time it had been possible to use sliders with custom joint positions. This is not longer the case, due to inconsistencies in how avatars would appear to themselves and one another (and changes would revert following a re-log). As the option wasn’t an intended feature for Bento, and given it can lead to inconsistencies (some of which can be fixed using Reset Skeleton, although this doesn’t work in all cases), the decision has been made not to allow sliders to operate on custom joints. The above discussions flowed into questions on whether it might be possible to just lock individual sliders at upload, rather than disabling their impact on a joint basis. This is viewed as not being possible, as it would require a more extensive overhaul of the avatar system and permission system. Paralleling this idea was a question on “partial shapes” for Bento heads, raised by Elizabeth Jarvinen (polysail). The idea here is that many shape creators sell their shape as No Modify, but if such a shape is used with a Bento head, it defeats the idea that the Bento head can be modified via slider. Again, there is no real means to achieve this without an extensive overhaul of the avatar system. There are also the points that if people are buying No modify shapes as they are unsure of using the sliders, they are unlikely to want to fiddle with the sliders with a Bento head, and those wishing to modify their body will likely use their own shape anyway, removing the problem of No Modify shapes (although re-creating a No Mod shape by approximation or XML export / import – via Develop > Avatar > Character tests > Appearance to xml – might be a hassle, with the latter requiring a suitable TPV for re-import). A further side to this is that a number of shape creators are already supplying body shapes intended for use with the various mesh bodies already on sale, as which are supplied Modify, which could be used with Bento heads. As I noted last week, gestures – such as for speech – can be stored as a part of an avatar’s outfit in the Outfits folder, allowing them to be automatically activated / de-activated. However, this has to be done by copying a link to the gesture into the required folder, as the Save Outfit function currently ignores gestures. Replacing outfits should then trigger gesture activation of those being added, and de-activate those gestures associated with the outfit being removed. This is not an optimal solution, but changes to have gestures made a part of the Save Outfit function are outside the scope of Bento, and Medhue Simoni has indicated he’ll raise a feature request on the idea for future consideration. Those using the development versions of Avastar 2.0 may have noticed a recent change in version numbering. This is because people were getting confused between the technical release number and the public incremental “Alpha” version numbering. Holly Kai Park makes a Second Life Editor’s Pick! Holly Kai Park made it into the Destination Guide on Friday, September 23rd – and was selected as an Editor’s Pick (see above)! The Park’s entry (shown at the foot of this article), can be found in the Nature and Parks section of the Destination guide, with the usual teleport links. The exhibition opens at 2:00pm on Saturday, September 24th at our new hill-top art display area, with Erin68 Frog and Satin providing the music at our new art events area on by the art displays. I’ll have more on the exhibition in a post here shortly – but you can get the low-down through the Holly Kai blog. We hope you can join us for the opening – but if you can’t, do please drop into the park and have a wander around. It’s there for everyone to enjoy.